calling out for a lighter, brighter color for Summer. on Pinterest lately and wanted to give the screen that shot of color. Here is a photo from this past Spring where the screen is in the background. calcium carbonate (both of which some people use for chalk paint). I mixed the paint and powder together first. adjust the amounts of ingredients if needed. Some folks like a thicker or thinner paint. but just mix up a bigger batch of the home made chalk paint. This screen has been painted several times in the past. it well and tape off the mirrors with Frog Tape. at Lowe's for only $3 each. They have good colors pre-mixed. the light green was painted on for the first coat. I am on a layered color technique kick right now. You could paint a project in one color with this paint mix. The second color painted on in blotches was the light blue. It was also mixed with the wall texture and water. them in her space at Luckett's and may have them re-printed. Just having Marion's t-shirt on made it more fun painting. ...but I wanted it MORE turquoise so I also used the "recipe"
with craft paint in the same ratio of paint/wall texture/water. opens up a big range of colors that can be made into chalk paint. I rubbed on a coat of clear Johnson's paste wax (at most stores). to get quicker results due to the paint's good adhesion. small area (or if you do, wear a mask to limit inhalation). I was happy with the blend of colors that emerged. that is also in the dining room. colored chandy and table center piece. (faux lobster trap floats) and was pleased with the results. "tweak" the "recipe" to get the look you want to achieve . paint mix adhere but a slick surface might require that. I would just add a little more water and mix it in. be pre-made and saved for future use. 15 pound box...maybe they make a smaller box now. Love this! I have an old table that I would deary love to use the ASCP on, but no dealer exists anywhere near! I'd love to try this! Thanks for sharing! Your screen looks terrific and the color is wonderful! Thank you for sharing your tips at Potpourri Friday! Wow! Wow! You go girl. This is amazingly beautiful. I love that you found a recipe that anyone can create with standard paints and products. The end result is stunning. How ingenious of you to make up your own concoction and work those colors out with layers. The effect is spectacular, and your room looks much more inviting with the sweet color in there. Thanks for the how to for making our own paint! the color is sooo beautiful ` you did an amazing job. the new color/look is amazing! The color came out soooo PRETTY...so now you have one stunning screen. Love this--it looks like real chalk paint. TFS! Hi I am in Australia and we don't have the ASCP out here yet but I have been making my own mixture similar to yours for a while know and love it! Your screen turned out fantastic! I am going to have a shot at doing some stuff with the craft paints and the mixture as I hadn't considered using them!! So beautiful...I have yet to try chalk paint but it's on my list for sure....such a fantastic piece, thanks for sharing! Your screen came out wonderful! I love the color and distressing. I've made my own chalk paint w/ unsanded grout and have had great results. I never thought to use craft paint, but that is a fantastic idea that I will have to try. Thanks for the inspiration! Wow, the screen looks so nice now! 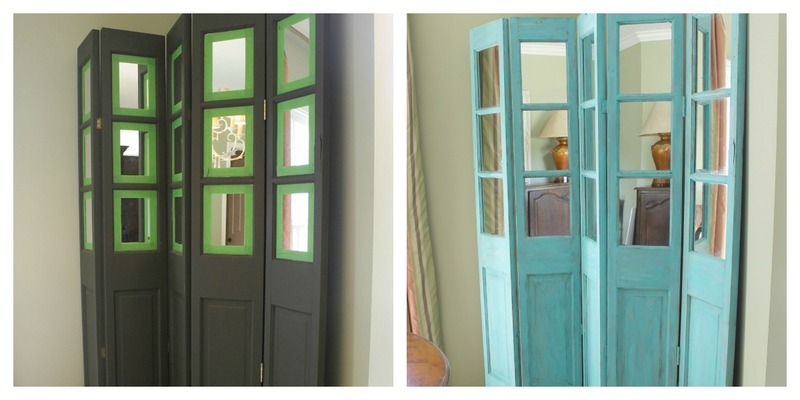 Love your chalkpaint treatment! You always have such great ideas! This is a beautiful color! I really love your blog! Thanks for sharing! Love the new color on that screen. You have inspired me to create my own chalk paint!!!!! I am so glad I found your blog! Thanks for the recipe! The mirrors look to DYE for!!! What a clever girl you are! Great job. LOVE your screen - it turned out great! 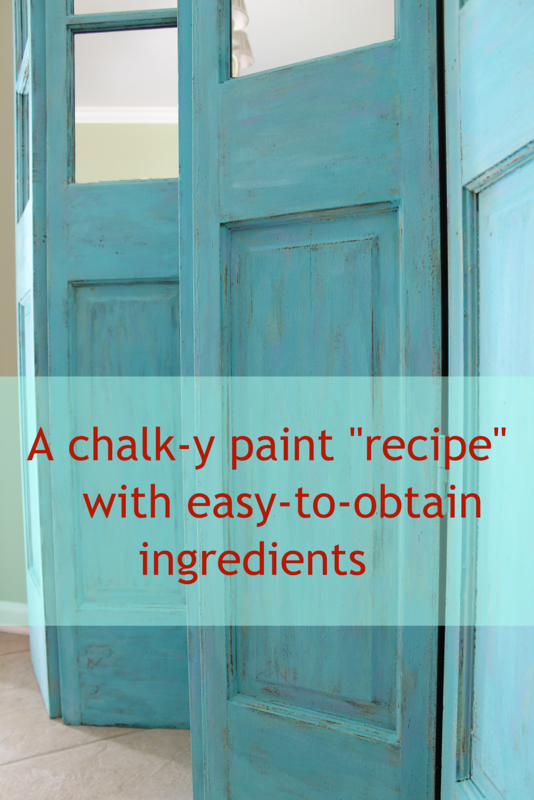 I don't use a lot of chalk paint so having a recipe that will allow me to make small amounts is great when I only need a little bit. Your color is wonderful! Love the screen. I've mixed up chalk paint using unsanded grout, and also using plaster of paris. I like the texture of the plaster of paris best. It doesn't harden quite as quickly. You did a fabulous job on your screen! Miss Kitty ~ You do the coolest stuff!! Oh my gosh, I love it. Such a fun pop of color! Love, love your dining room. Wonderful result on the mirrored screen. Love the color. I've also used acrylic paints to get the color I wanted. Where did you get that screen? I want one!!!!! Just a tip...I think valspar paint has primer in it and I tried to make chalk paint with a paint with primer in it once and it gets thick fast almost immediately and is hard to keep it thinned out, but if you use regular paint it doesn't get thick and can be stored for a long time without getting thick...I use plaster of paris...I did the recipe with non sanded grout and it does not store well it thickens too fast...I love chalk paint...a great tip also is to mix your plaster of Paris with really hot water to dissolve it first then add it to your paint and your paint will be alot less gritty!!! Hope this helps someone!! Love the topic of chalky paints, I have tried my hand at it a couple of times myself, your work is way better than mine.